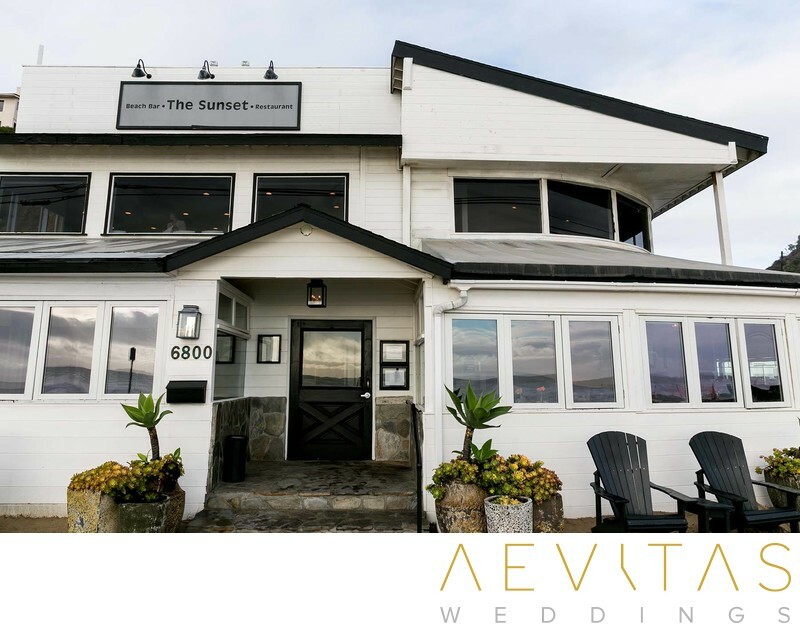 Situated on the spectacular Malibu bluffs overlooking the Pacific Ocean, The Sunset Restaurant is housed within an atmospheric two-story beach bungalow. The venue has been designed to host both wedding ceremonies and reception functions, meaning ease of planning and more time for wedding photography on your special day. You can exchange vows on the white sands of Zuma Beach, with yachts drifting by in the distance and the luminescent blue of the Pacific Ocean waters behind. Then invite your guests into their private outdoor lounge where cocktails and hors d’ouevres will be served, while you escape for a romantic sunset couple portrait session. The ceremony space can host up to 150 seated guests, with white wooden chairs and a velon aisle included in The Sunset Restaurant wedding packages. Receptions are held in their spacious restaurant, with the white shutters and beach-inspired decor giving the venue a relaxed, yet distinctly romantic atmosphere. White fabric lines the ceiling, while expansive windows offer unforgettable views across the coast. There is plenty of opportunity to design the space with your own, personalized decor, while The Sunset Restaurant takes care of all the furnishings, tableware and logistics of your wedding reception. The Sunset Restaurant is renowned for its fine cuisine and their expert chefs will tailor their wedding day menus to the couple’s individual tastes and desires. All beverages are provided by the venue, with a team of highly experienced event staff ensuring your wedding guests are looked after throughout the evening. For couples after more intimate wedding day celebrations, The Sunset Restaurant also has two private second story rooms, both of which boast equally impressive views and cater to around 20 guests. Alternatively, these rooms can be used by the couple for getting ready, meaning your entire day can be held in the one location and completely stress-free.